Features and Benefits: 222 lumen light output. 140 meter beam distance. Max Beam Optic System; Bulls Eye Spot beam. Impact and water resistant stainless steel casing with front switch. 3.9 inch length. The stainless steel body of the Coast A15 flashlight is not only great looking, it is also a favorite of mechanics and other professional users because it is easy to clean when it inevitably gets covered in grease and gunk around the shop. 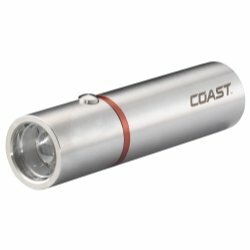 The high intensity LED combined with Coast's Max Beam Optic System gives you the maximum amount of usable light for your application. Tested and rated to ANSI/FL1 standards by an independent laboratory. 3 AAA batteries included. If you have any questions about this product by Coast, contact us by completing and submitting the form below. If you are looking for a specif part number, please include it with your message.